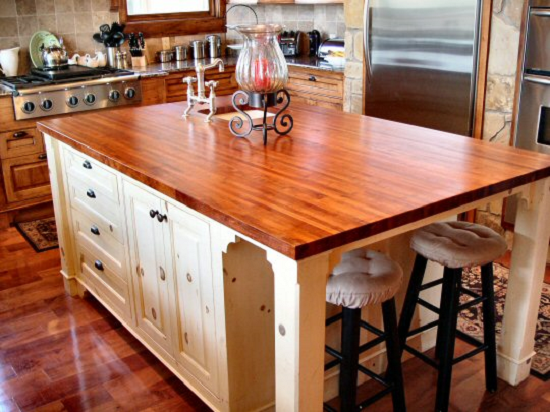 A beautiful and durable counter-top is the ‘crowning glory’ of a well-designed kitchen. And just as the right style of hat compliments a smart outfit, a worktop is not only an important feature of kitchen cabinetry, it's well laid out configuration is a noticeable finishing element of the entire kitchen. In today's kitchen designs, you will find kitchen worktops made from natural materials like slate, quartz, stone, granite, marble, and hardwood. They also come in man-made materials like stainless steel, laminate, recycled glass, Corian (solid surface composite), and ceramic tiles. 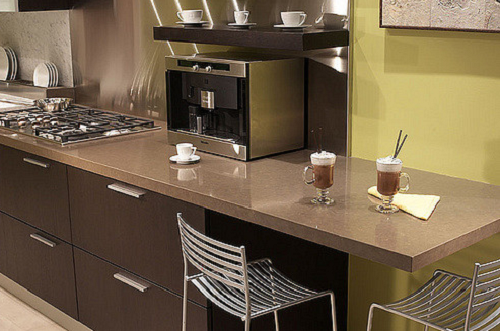 Each of these countertop materials has its own distinct character, texture, and appeal. They are generally beautiful, possess unsurpassed durability, and are mostly long-lasting. So, if you feel these durable and attractive worktops are unaffordable, it good to remember that their allure and longevity are well worth the extra expense. 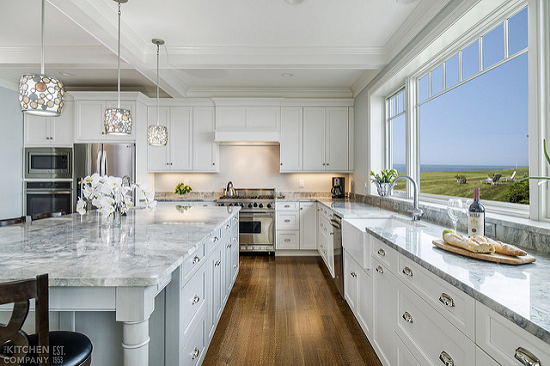 In 2016, kitchen designers mostly specified the following which can be described as the top five - quartz, granite, marble, Corian, and butcher's block (hardwood), in this order of preference. Quartz kitchen worktops have a refined, lustrous, and polished look and a very sophisticated appearance similar to granite. A man-made version of granite, engineered quartz is incredibly hard-wearing and water resistant. With a quartz countertop, you'll get a more consistent colour and finish, unlike what you get with granite and marble. Its surface doesn’t harbour or breed bacteria, it is easy to clean, and it is stain resistant. A quartz countertop. Notice the lustre, beauty and sophistication of this kitchen worktop. Durable and hard-wearing, quartz counters come in an immense range of colours - from pure whites to greys, deep reds, browns, mirrors and sparkles, virtually in all the colours of the rainbow. Granite is the second most sought-after worktop for kitchen top surfaces. 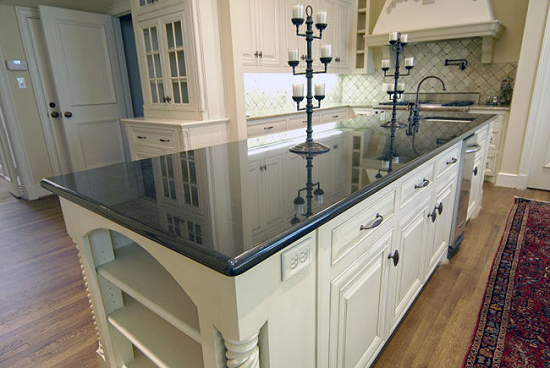 A natural stone material, it is the only material that ranks close to the perennial top choice, engineered quartz. Granite countertops come in various shades and a mix of colours which depends on the region of the world it originates from. Because it does not breed bacteria, its hard cold surface is perfect for food preparation like rolling pastry, seasoning meat cutlets, cutting vegetables, and breadcrumb(ing). Granite kitchen countertops last almost forever. Black granite kitchen worktop - perhaps the most beautiful type of granite tops in today's modern kitchen. It is considered stylish, elegant and powerful with regal elegance by interior and kitchen designers, no wonder that it is in such high demand. A black granite worktop is an excellent choice for any kitchen. Many homeowners that desire natural stone kitchen worktops usually opt for granite. But the price of granite countertops comes with a high price tag. In this case, marble is usually the second choice. Marble counters are more affordable than granite, quartz, or even slate and because it is 'softer' than granite (it can be crafted into any form or design - fine pestle and mortar sets, rolling pins, and pastry boards), the counter edges can be moulded, rounded, or lightly carved. One great feature of marble - it comes in an array of colours that are hues and shades of earth tones. From white to salmon, emerald to olive brown, the beauty of the stone lies in its wonderful grains (strokes and lines) that crisscross along the slab. The downside of marble worktops is that because it is a porous stone material, it absorbs stains pretty rapidly. White marble countertop installed on pure white kitchen cabinets. The characteristic streaks and grain of this marble showcasing gentle grey and taupe hues fit beautifully within a variety of settings, especially in smaller sized kitchens. A smart and contemporary look. Without doubt one of the market leaders in kitchen worktops, Corian solid surfaces are versatile and durable and can be easily repaired in the event of unsightly scratches and chips. Corian kitchen worktops are cool to touch with an elegant smooth surface that is not only non-porous and stain-free, it is also extremely hygienic because it doesn't trap bacteria and dirt. It also resists the growth of mildew and mould as its flowing seamlessness and coved backsplashes means there are no crevices to trap filth. Corian countertops lend themselves to imaginative uses, innovative designs and enduring work surface applications and can accommodate any aesthetic, from modern (contemporary) minimalism to classic traditional kitchen designs. 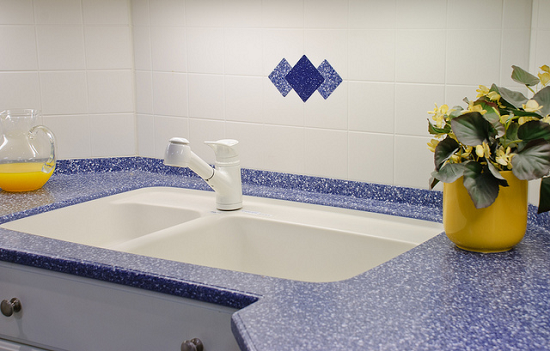 Worktops are available in a wide array of visually pleasing colours. Beautiful Corian kitchen cabinet worktop and sink. Made from high-performance DuPont, this solid surface composite is available in a dazzling array of colours, forms, and styles. If you desire a ‘warm’ classic look and feel in your kitchen, something unique and exotic, butcher's block should be your choice. Formed by joining and pressure bonding staves in a vertical formation, end grain butcher's block worktops have a unique type of construction in contrast to solid wood kitchen worktops. They are extremely hardwearing and durable and its tactile surface is suitable for direct cutting and food and meat preparation. The end grain of the worktop - which is not usually visible on a standard hardwood kitchen counter is also endowed with a unique depth to its grain pattern giving it a stunning and individual aesthetic appeal. Butcher blocks come in a variety of wood species to suit all requirements. They can be produced with two different wood types, for example, a maple and walnut mix, or a single wood type like oak butcher blocks which convey a classic, welcoming look. Butcher's block kitchen counter surface with a unique grain pattern you'll never find in standard hardwood kitchen countertops.